The larynx is made of cartilage and is suspended from the only free floating bone in the body, the hyoid bone. A precise series of muscles maintain the position of the hyoid bone and larynx. Because all of the connections to the larynx are by muscle (it is suspended from the hyoid bone which is suspended from the tongue and styloid muscles that run from the back of the skull) your posture will greatly affect the position of the hyoid bone and larynx and shape of the throat. Poor posture can actually bend the soft tissues of the larynx. Good, upright posture with the head balanced centrally over the torso, allows the throat to be open and free. Poor posture, especially posture that pulls the chest down and head forward, will close the throat. Think of having a long back-of-the-neck with the chin parallel to the ground head position. One of the biggest mistakes singers make is to lift the head upward while singing. It has become a big habit in popular singing, but you will never see head lifting it classical singing. This actually pulls the larynx and the throat out of alignment and makes it harder to sing. Have a friend view you from the side. Your ear should be centered over the top of the shoulder, which should be centered over the top of the hip, which should be centered over the side of the knee, which should be centered over the anklebone. Try moving the head in different posture while chanting Ahhhhh. Notice if the sound changes in any way. In the photo above, the hyoid bone is the horizontal bone in the middle of the photo. 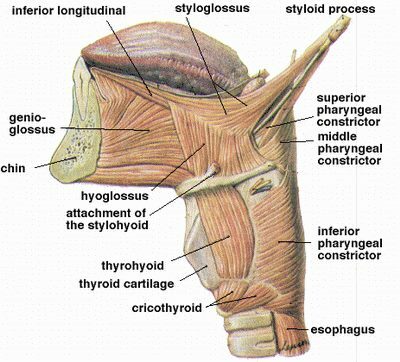 The thyroid cartilage is the adam’s apple, the genioglossus is the tongue and the pharyngeal constrictors are swallowing muscles that need to remain released during speech and singing.